Purushottam Nitai Das: When Lord Jagannath with his elder brother Balarama and little sister Subhadra enthrone the beautifully decorated majestic chariots on the Rath Yatra day then the hearts of lakhs of people dance in joy. After snana yatra, Lord Jagannath remains confined in a secluded place for 15 days. During this period he performs his pastime with the goddess of fortune. He then takes permission from her and comes to ride on the chariot to give pleasure to the devotees. And the devotees without any delay enthusiastically start pulling the ropes of the mammoth chariots to invite the Lord to reside in their hearts. The chariots sometimes move very fast, sometimes very slow and sometimes just stand still even though it is pulled vigorously. It is said that the chariots move by the desire of the Lord and not by the efforts of an ordinary person. The forms of the three deities are quite unique. They have big round eyes, have a huge smile on their faces but have no hands and feet. It is said the chariot festival began around 5000 years ago when Lord Krishna met brajvasis in Kurushetra after several decades of separation. Krishna was the darling of braja but when he left them then all the brajvasis were devastated. Every moment they would remember Krishna would always talk about Krishna and would hope that one day their Krishna will return back to Vrindavan. Krishna although had left Vrindavan but he too always remembered his cowherd friends, his mother, Yashoda, his father, Nanada Maharaja, and of course the love of his life, Srimati Radharani. Once there was a solar eclipse and Krishna along with his brother Balarama and sister Subhdra travelled on a chariot to Kurushetra to observe the Vedic custom of taking bath in a sacred place during the solar eclipse. The residents of Vrindavan too had come to the holy city. And here after several years Krishna and brajvasis saw each other. Their hearts danced in joy, eyes were filled with tears. Overwhelmed with love and with broken words they complained as why did he betray them? Why did he not keep his promise of returning back to Vrindavan? Krishna was speechless, how could he make them understand that although physically he may not be with them but his heart was always in Vrindavan. 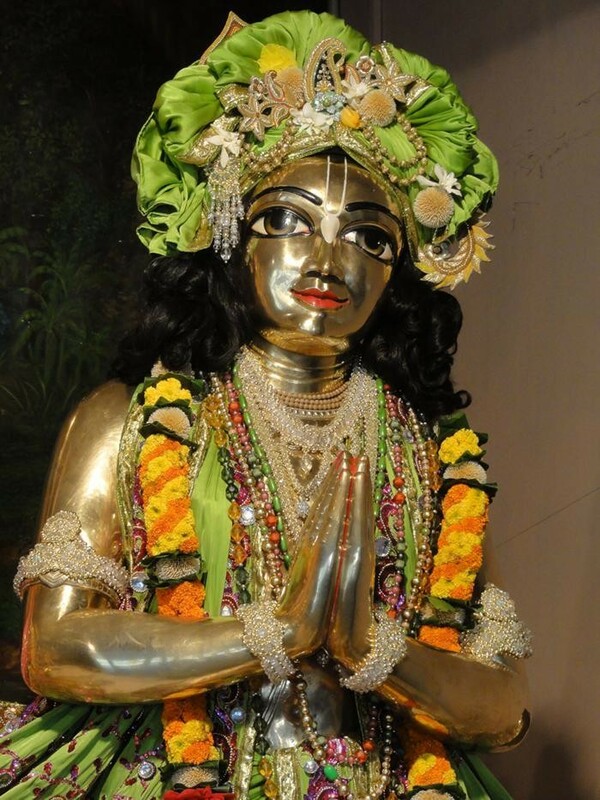 Krishna was now the king of Dwarka, he was dressed gorgeously and was on a beautiful chariot. He was accompanied by beautiful queens and hundreds of soldiers. The residents of Vrindavan did not like the opulence of Krishna. For the gopis Krishna was their paramour, for gopas he was their friend with whom they joked and played and for Nanda and Yasoda he was their naughty little child. Such simple, selfless and pure love can be experienced only in Vrindavan. They wanted him to come to Vrindavan and so all the brajvasis started pulling Krishna’s chariot to Vrindavan. To commemorate this beautiful pastime Rath Yatra is celebrated.